Sonoma Smiles is bringing hope to patients using the Teeth Tomorrow® process delivering full arch Prettau® Zirconia bridges. The superior lab-processed provisional, and final Prettau® Zirconia prosthesis put an end to the suffering endured by patients with missing and failing teeth. This woman was quite young for such advanced oral disease, and it is likely that she had a genetic predisposition that made her particularly susceptible. Even with her bonded teeth, she had terrible trouble chewing food, suffering severe discomfort that affected her general health, nutrition, and quality of life. To accomplish this, Dr. Sutton removed all of her remaining upper and lower teeth, and built up the bone to support her upper implants. Her provisional upper and lower restorations look and feel like natural teeth to her, and she is extremely happy and excited to chew normally again. In a moving video testimonial, the patient described her sheer joy in simply being able to bite into an apple – something she hadn’t been able to do since she was a girl. Teeth Tomorrow™ dental prosthetics are constructed using 3D dental imaging, customized for each patient’s unique smile. Each Lab-Processed provisional provides patients with a level of comfort and durability not available from chair-side devices. The final Prettau Zirconia Bridge™ is a one-piece, non-porous, chip and stain resistant device, hand-finished to create an individualized, natural look. 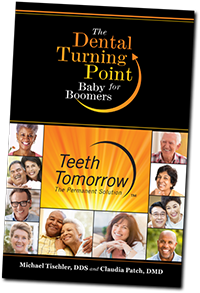 The Teeth Tomorrow® Network is the only National US dental franchise dedicated to full arch zirconia as the final product. Network membership is only granted to carefully selected practices committed to providing advanced dental implant reconstruction services, and is limited to 250 exclusive market territories. Sonoma Smiles’ experienced dentists specialize in a wide array of cosmetic, preventative, general and specialized dental services from its practice at 1330 Medical Center Drive, Rohnert Park, CA. They joined the Teeth Tomorrow® Network in 2016 as the exclusive franchise in the Sonoma County market territory. The Teeth Tomorrow Network consists of advanced implant dentists delivering a proven full arch Prettau zirconia solution to their patients. The network doctors utilize the established Teeth Tomorrow clinical, laboratory and marketing protocols, working together to share knowledge and further the success of the Teeth Tomorrow brand, setting the gold standard for top recognized dentists for full arch restoration. The network enables members to expand their advanced prosthetic and restoration practice through success-proven delivery protocols, inclusive doctor/staff training, an exclusive market within a designated territory, and customized national marketing and advertising support.